go here for the zip with 1920x1200, 1680x1050, 1600x1200 and 1280x1024 resolutions. Till KISUKI.net is up, (or I update Tsumaranai) this will have to do. needed a new desktop, plus when I saw this artbook's scans my first reaction was REMOVE spinZAKU IMMEDIATELY! and so I slapped two scans together. Tsk, haven't done a wall in aaages. What fabulous painting! The colors are just so soft and blend perfectly in with one another. This is something we don't see much of on MT: a "rough" style of painting that doesn't look ugly or messed up. And can you believe the background was done from scratch? I really adored the rough painting style, it somehow reminds me of some classic painting. Very oily and texturey. Awesome job esp. on the background and also reconstructing C.C's dress. ah... though... Lelouch and CC (?sorryimliketheonepersonherewhohasnoideawh(...) eyes don't line up... are they supposed to be looking into each others eyes? because it looks like CC is at his chest. Redrawing the C.C. dress (((that's is a perfect CLAMP work))) to make it look like THAT is something to be proud, it's very beautiful and it totally fits the image. I really like the way you manage to make the wallpaper look like a paiting. -And yes, there's something strange about eyes, cat's eyes, specially on C.C. ; I don't know, but anyway I also like that part. Wow i have no words to describe this, this is beautiful beyond words. Wow, this wallpaper really is stunning. I love your painting style and adding C.C. 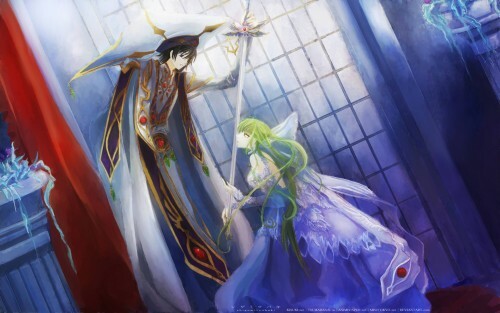 to that wallpaper instead of Suzaku was a wonderful idea. Both pics blend in fantastic. The colors are amazing and I love everything about this wallpaper. Lelouch! CC is very pretty! n this wall just like a painting! Highlighted in AP and not surprisingly... highlighted here. Definitely the best work I've seen in a long time. This is fantastic! This is incredible! Your blending of the two images was flawless, so much so that I at first thought "omg there's a version of this picture with CC around?!" And that background... I never would have GUESSED you did that all by scratch. WOW. You're extremely talented! I...I don't even know how to start this comment.